Gaborone — Member of Parliament for Boteti West, Mr Slumber Tsogwane has officially been endorsed and sworn in as Vice President of Botswana. According to the constitution, 57 elected MPs are eligible to vote, but only 55 MPs participated including President Mokgweetsi Masisi who is an ex-officio member. Currently, there are two vacant posts in Moshupa-Manyana and Mochudi East Constituencies. Mr Tsogwane was endorsed by a simple majority vote of 35 MPs, one voted against, two votes were spoilt, five abstained from voting while 11 MPs did not vote, and two MPs were not present. 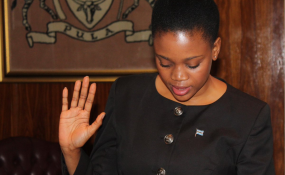 The post of the Vice President became vacant following the transition to the ascension of the then Vice President Masisi to the highest office on April 1. Prior to the endorsement, Speaker of National Assembly, Ms Gladys Kokorwe explained that appointment of the Vice President was effected by the President from amongst persons who were elected as opposed to specially elected MPs. Mr Tsogwane currently serves as the chairperson of the ruling Botswana Democratic Party. Prior to his appointment, he served as the Minister of Local Government and Rural Development, the position he held since November 2014. He has been MP for Boteti since 1999 and has served as chairperson of various Parliamentary committees such as HIV/AIDS and Health as well as labour between the years 2000 and 2002. In addition, he has also served as Assistant Minister of Finance and Development Planning in 2004-2009.